The Pittie Group, nationwide distributors for Patanjali Ayurved, has announced its distribution arrangement with Apollo Pharmacy, the largest pharmacy chain in the country. With this association, a range of Patanjali Ayurved products will be made available in all 2,200 Apollo stores across the country, Pittie said. The company claims Patanjali's presence in the FMCG sector will become even more formidable with this new association. 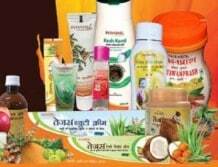 "Since Apollo Pharmacy has the largest branded pharmacy network, we will be able to enhance the reach of Patanjali. This agreement is another step towards our mission of providing Patanjali's high quality products to every Indian consumer. Over the next few months, we also plan to work with several more such key players to help the Patanjali brand grow and to strengthen our distribution network," said Pittie group CEO Aditya Pittie. Apollo Pharmacy, a part of Apollo Hospitals group, runs 2,200 pharmacies across the country providing a wide range of OTC medicines and products in various categories, including personal care and health supplements of different brands and also of its own. Pittie is a diversified group with interests in real estate, FMCG, media and entertainment and e-commerce among other areas.